Interest rates remain near historically low levels. This is great for the economy and the financial markets. Those who thought Value is dead probably had a rotten January, at least if they acted on such assumptions. Quant investing is not magic. It’s the application of objectivity, discipline, and systemization to a very challenging task and its merit lies in the notion of a sensible process that can better serve investors. Investing based solely on the value factor makes no more sense than investing buying a home based solely on the price (and without looking at any characteristics of the home). Where is the stock market going? Up Down? Sideways? We devote considerable time and resources to seeking answers despite the reality that few among us, if any, can give consistently reliable answers to such questions. ROIChristie... unless you lose your job in which case the business cycle must be conquered once and for all. patrick_oshag Because creative people have boring friends who recommend boring content? Provides on-line platform enabling investors to follow and invest in quant models, to create their own quant strategies, and research stocks and markets; I do product development, commentary, education and edit Forbes Low-Priced Stock Report (through joint venture between Portfolio123 and Forbes). A screening-based value strategy and a market-implied valuation approach to assessing valuations of individual stocks. 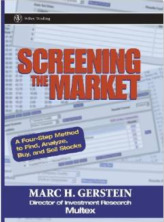 An Accessible and Systematic Stock Screening Method to Improve Profits. 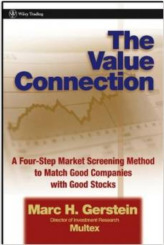 Turns the chancy art of picking stocks into a screen-based science. Next time someone tells you to do your stock market homework, tell them you read this book. Step 1: Find stocks worthy of consideration, Step 2: Analyze stocks that come to your attention; Step 3: Buy the ones that most match your criteria, and Step 4: Sell the ones that meet your sell rules.